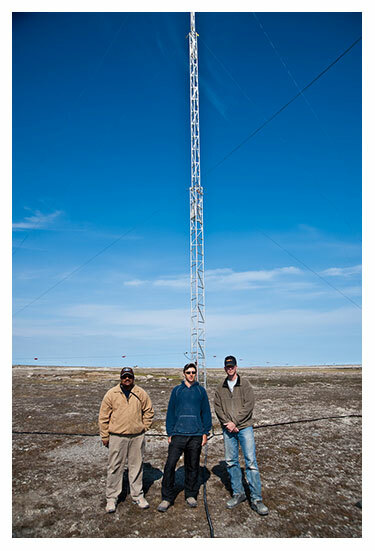 Physicists from the University of New Brunswick’s Radio Physics Lab have developed a new model that will help Canada monitor activity in the arctic and improve arctic communications. The Empirical Canadian High Arctic Ionospheric Model (E-CHAIM) is the first phase of the UNB Radio Physics Lab’s $1.2-million All Domain Situational Awareness Program contract with Defence Research and Development Canada. Dr. P. T. Jayachandran, UNB physics professor and principal investigator for the Canadian High-Arctic Ionospheric Network, is leading the project. Dr. David Themens, who was a graduate student at the physics department of UNB, is leading the development of the model. Space weather can cause significant disruptions to high frequency radio transmission, global positioning systems, and navigation technologies. Aircraft re-routes and other costly service disruptions occur regularly because of ionospheric disturbances. The ionosphere also facilitates the use of long-range communications and early warning radar systems, but poor modeling in the past has limited the deployment of these technologies and prevented their use in the Canadian Arctic. If successful, E-CHAIM will provide users with significantly improved high arctic communication and monitoring capabilities and will act as an integral tool for designing future high frequency communications and radar systems. For the two remaining phases of the contract, the UNB Radio Physics Lab will develop a sophisticated data assimilation system capable of capturing space weather impacts on the ionosphere using similar techniques to those used by meteorologists around the world.